How does this happen? Virtually overnight, a plant we never planted and that has never been seen before in our garden appears in the shade garden and seems to be thriving. Not one, but four of the same plant appears uninvited and they have made themselves very comfortable in the shaded bed at the back of the house. All in different places, a few feet apart. ALL the plants around it, apart from the Delicious Monster that has been there for years, were newly planted in August last year. The Lamium is new, Azaleas are new – you can see they are all fledgling plants … and as if from nowhere they are joined by an uninvited “guest planting”. I’m not complaining … I rather like it. 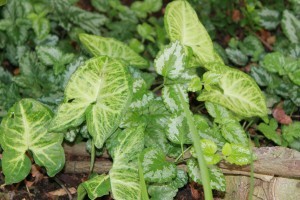 I think it is called Arrowhead Plant (Syngonium podophyllum). I recognise it as a very common house plant. I see these at nurseries, in magazines and even in the homes of friends as indoor pot plants. I am guessing that its been there for a few weeks and was not “weeded out” as the seedlings probably looked similar to the Lamium which has been planted here as a ground cover. Seeds blown into the garden? Unlikely. We have a six foot wall separating our property from the neighbours.So how did it get there? (I had compost laid a month ago – it may have originated from that). I’m not removing it. I think it looks great. Its thriving. It looks happy. Might that be a clue there – plant indoor house plants in that bed? If, indeed, these are caladiums, within a few years you should be able to dig up dozens of bulbs to share. 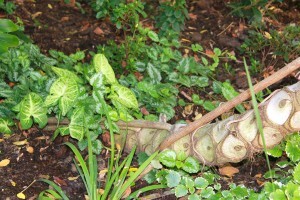 In our gardens, we have several “houseplants” that have adapted to the outdoors. They inject a tropical look and feel to the area. This is a really nice plant – seems quite popular with our gardening friends and my first thought was it must have come from compost. It looks like a most welcomed gift from heaven. I’ve never heard of houseplants moving outdoors! What a surprise indeed! Well, those came uninvited…the same is happening in my garden and Ive them potted cos they look so great! They are also known as caladiums, mine is red n green with white blotches. 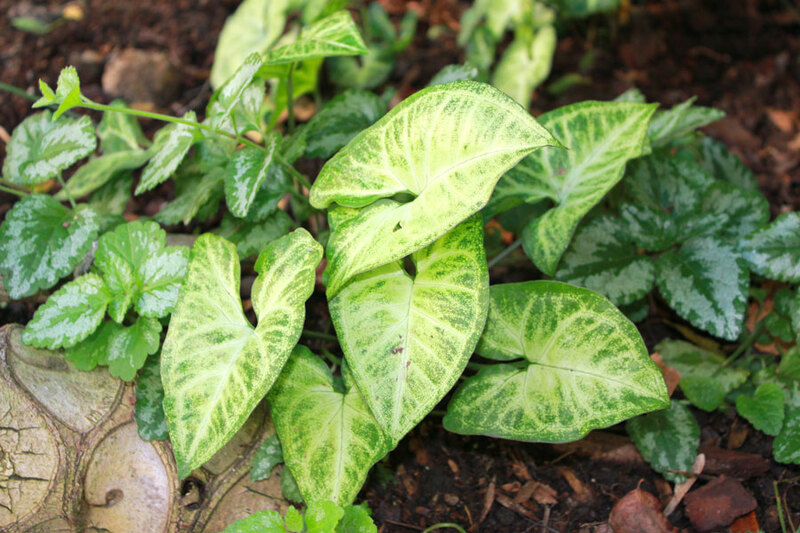 Im also looking for other varieties like yours cos they look great as houseplant! I will trade you a hundred — no a *thousand* of my “uninvited guests” (violets) for one of yours. I wish my weeds were so pretty:(. I think it looks great too. I have that same plant. I threw it into the compost pile 2 years back but it survived and is crawling up the wall. I thought it looks pretty good vertically so I’m leaving mine untouched. Ahh, so then its almost sure mine arrived via the new compost! I had this happen with indoor ivy. But they found their way to my garden from the container I had them planted in that I moved outdoors for the summer. The vines rooted in the soil below and now come back each year. Both ivy that did this are rooted at the base of the brick building. Just warm enough I guess and they come back each year. Nice surprise for your arrowhead.